What is "The Ashes Bail"? Most of us are aware of the little Ashes urn and velvet bag, locked away at Lords – two fanciful gestures given to English captain, Ivo Bligh, on the 1882-83 tour of Australia. These emblems – a lighthearted Austral response to a satiric published obituary for English cricket in 1882 – have so captured the public imagination. a letter opener, carved from one of the bails used in the Third and deciding Test at the SCG when England 'won' the Ashes. Symbols nourish identity, affirming unspoken values and beliefs that captivate the young and reassure older Australians. The Ashes Bail symbolizes cricket's greatest rivalry between two countries – and represents both winning AND losing – commemorated in "friendship and esteem." The Clarke family were inextricably involved with our Ashes history. William Clarke was one of Australia's major landowners and President of the Melbourne Cricket Club. With the excitement generated by Australia's win at the Oval in 1882 – it was Clarke's personal sponsorship that ensured a reciprocal visit from the English team – eight amateurs and four professionals. They left England, with the Clarkes, three weeks after Australia's win. On the sea voyage to Australia, Gladstone, the British Prime Minister, recommended a Baronetcy for Clarke – and Queen Victoria duly made Clarke Australia's first Baronet. So much for cricket not holding political clout in this period. Also on board was Florence Morphy, governess to the Clarke children – a beautiful young woman who was to play a pivotal role in subsequent proceedings. In Australia Clarke created a social game for the English team at 'Rupertswood', his Sunbury property, before the tour formally started. Thus on Christmas eve 1882, before a ball was bowled in anger, Clarke presented Bligh with the little urn, a playful reference to the Sporting Times R.I.P notice on the death of English Cricket. Lady Clarke had burnt Florence Morphy's veil as a keepsake for Bligh and the ashes contained in the urn came from this source. With the words 'veil' and 'bail' barely distinguishable, it's no wonder that the origin of these ashes became a source of confusion and controversy. The gesture was in keeping with the Victorian era of gift-giving and betrothing– a playful jest that, at the same time, provided a potent symbol of regeneration and fertility. 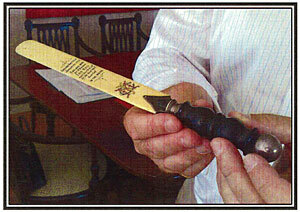 During the tour, following the English winning the Ashes in the Third Test at the Sydney Cricket Ground, Lady Clarke received the gift of the bail fashioned into an inscribed letter-opener from Bligh. While the media in Australia have been absorbed with the little urn - and why our Australian Cricket Team cannot get their hands on it, despite their winning ways – this splendid Ashes trophy exists close to hand. Within it, lies the heart of the game. Such gift giving was part of the ceremonial nature of the game, a ritual exchange, built on reciprocity and respect. We know from Melbourne Cricket Club records that the eight English gentlemen cricketers were then made Honorary Life Members of the Club at a dinner on March 13 1883, where Bligh delivered a speech saying he didn't win the 'Ashes' and that they should be buried in the outer of the MCG. He declared that Murdoch and his Australian team were not to have it (having only drawn their recent encounter two games each). The urn, bag and letter opener all stayed at 'Rupertswood,' the Clarke's family residence, until Bligh returned later in 1883. Some short time later, on 19th February 1884, Ivo Bligh and Florence Morphy were married at 'Rupertswood', in a wedding ceremony and reception, generously hosted by the Clarkes. The Bligh' s first child was born in Melbourne before they returned to England and Bligh became the eighth Lord Darnley in 1900. The current Lord Darnley has claimed that the 'Ashes' urn is not a cricket trophy, but "a personal and romantic keepsake" of his grandparents, and that the urn and the velvet bag will stay at Lords for safekeeping. There they should stay. The Ashes Bail is in Australia – I believe it embodies the values and beliefs that Ashes cricketers fight for – the 'fraternal' rivalry that is only possible between nations that have enjoyed such seminal ties. It is the real trophy. Forget the Urn, Hail the Bail! As was the custom of the time, artifacts were transformed into useful items of equipment, therefore the family fashioned The Ashes Bail into a decorative letter opener which measures 292mm. The Ashes Bail, sealed and coated through a burnished pewter finish, forms the handle of the antique ivory blade, with silver used to meld the bail and ivory. Adjoined to the spigot of the bail is a silver knurl. The Ashes Bail is provided by the direct descendants of Sir William and Lady Janet Clarke. Further information pertaining to the provenance is available upon request.